^ "Export Partners of Macau". CIA World Factbook. 2012. Retrieved 2013-07-23. ^ "Import Partners of Macau". CIA World Factbook. 2012. Retrieved 2013-07-23. ^ Hui, Samuel; Aspalter, Christian; Lai, Dicky (March 23, 2012). "Social Welfare in Macau - Between East and West: A Comparative, Analytical Welfare Regime Perspective". doi:10.2139/ssrn.2027764. ^ Hui, Samuel; Aspalter, Christian; Lai, Dicky (March 23, 2012). "Social Welfare in Macau — Between East and West: A Comparative, Analytical Welfare Regime Perspective". doi:10.2139/ssrn.2027764. ^ Ferrao, Silvia O. S.; Gaspar, Elisa Lei (May 2, 2013). "Public healthcare system in Macao: Communication System in Crisis Situations". Institute of Electrical and Electronics Engineers. ^ Chou, Bill K.P. (October 1, 2016). "Public Sector Reform in Macao After the Handover". China Perspectives. ^ Sheng, Li; Tsui, Yanming (October 1, 2009). "A general equilibrium approach to tourism and welfare: The case of Macao". Habitat International. 33 (4). The Individual Visit Scheme began on 28 July 2003. It allowed travellers from Mainland China to visit Hong Kong and Macau on an individual basis. Prior to the Scheme, Mainland residents could only visit to Hong Kong and Macau on business visas or in group tours. 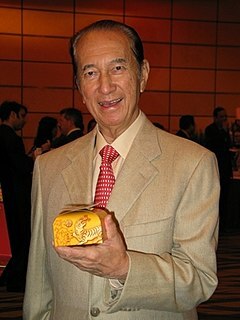 Dato' Sri Stanley Ho Hung-sun is the founder and Chairman of SJM Holdings, which owns nineteen casinos in Macau including the Grand Lisboa. Ho has been nicknamed variously Godfather and King of Gambling, reflecting the government-granted monopoly he held on the Macau gambling industry for 75 years. His wealth is divided amongst his daughter Pansy Ho who owns MGM Macau, fourth wife Angela Leong who is managing director of SJM Holdings, and son Lawrence Ho who owns City of Dreams. The Macau pataca or Macanese pataca is the currency of Macau. It is subdivided into 100 avos, with 10 avos called ho (毫) in Cantonese. The abbreviation MOP$ is commonly used. The Government of the Macau Special Administrative Region allows citizens of specific countries/territories to travel to Macau for tourism or business purposes for periods ranging from 180 days to 14 days without having to obtain a visa. For other entry purposes, such as establishing residence on a long term basis, a different policy applies. Gambling in China is officially illegal under Chinese law. In practice, however, Chinese people can participate in state-run lotteries and engage in legal gambling in the special administrative regions of Hong Kong and Macau, whose legal systems resemble those of European countries which formerly administered those regions.